Right-on-the-sand waterfront dining north of La Jolla can be surprisingly sparse. Fortunately, there are still several worthy options available, even if it’s more likely to find restaurants across the street from the beach than smack dab on it. We’ve included several of those spots here, from formal to informal, oceanfront to lakefront, and on the sand to not, but with amazing sea views anyway. Jake’s sits right on the sand close to Del Mar’s Powerhouse Park. Upscale and beachy, Jake’s boasts enormous windows offering unfettered views of the ocean. For full effect, dine at sunset. Next to Jake’s and also sitting virtually on the beach, Poseidon is lower-priced and more informal than Jake’s, but still delicious. If you’re looking for beachfront brunch options or a special place to celebrate, you will not be disappointed – Poseidon’s food is award winning. If you’re not in the mood for brunch, you’ll find something else to enjoy from the predominantly seafood menu. Try the ceviche, it’s a standout. One of Del Mar Plaza’s rooftop icons, Pacifica is an award winning seafood restaurant. Happy Hours go from 4-4:30PM at Pacifica’s Ocean Bar, which is also known for serving more than 100 vodka varieties. Dine in the fall and enjoy a two-course sunset supper for less than $26 until 6PM. Ocean views are abundant even if Pacifica is located a block away from the Pacific. Yep, PCG is another smack-dab-on-the-sand restaurant, this time located in Cardiff. Choose the first or second floor patio for seating, and you’ll be good to go with the view action. It’s also not unusual to catch a glimpse of dolphins, which is made all the better when you’re chilling with a margarita and calamari. Situated between the ocean and the San Elijo Lagoon, the Chart House is surrounded by water views. Get there early for happy hour and stay for a steak and sunset. 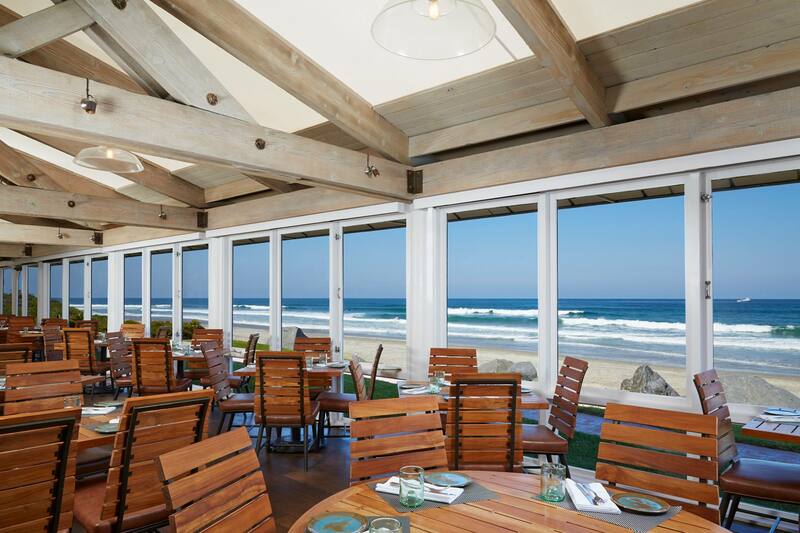 Floor-to-ceiling windows and plenty of ocean-view seating make the Chart House a beach dining favorite. An informal eatery serving healthy California cuisine a short walk from the beach, Ki’s outdoor seating and ocean views make it a Cardiff hot spot. Try visiting during Happy Hour from 4:30-6PM for sunset hour food and drink specials. Ki’s brunch also draws the crowds, as does Mexican Monday’s taco bar. Right across the street from popular South Carlsbad State Beach, Chandler’s Restaurant and Lounge, located at Cape Rey Carlsbad Resort, serves California coastal cuisine quite literally. A glass-walled patio and seating affording amazing sea views are all part of the ambiance, which is truly something special. Enjoy dining amidst the waves and Chandler’s live music, playing every Friday and Saturday from 5:30-8PM. A beloved Italian restaurant across the street from the ocean in Carlsbad, Vigilucci’s unobstructed ocean views and patio dining make it a favorite with locals. Watch the sunset over Carlsbad State Beach from Dini’s front patio and give thanks you live in San Diego. Dini’s serves American cuisine like salads, sandwiches, pizza and meat and seafood entrees. Located in Carlsbad Village, Harbor serves its signature fish and chips along with other seafood dishes in an outdoor area with ocean views and a casual, beachy ambiance. Take a seat on the patio (go for the north corner) and relish the proximity of the waves and Oceanside Pier. A Cohn restaurant, 333 Pacific’s fusion menu doesn’t disappoint, and fabulous birds-eye beach views makes the dining experience even better. Hello Betty’s rooftop lounge features sweeping ocean views and SoCal beach cuisine like fish tacos, oysters, chips and guacamole with libation accompaniments including margaritas and beer. Check Betty’s website for its Tunes at Twilight live music schedule happening on the patio select days from 6-9PM. This iconic ‘40s-style diner sits at the end of the Oceanside Pier for truly epic water views in a casual setting. Speaking of the Oceanside Pier, Tin Fish is located under its entrance and boasts fun views of frolicking beach action. The menu includes fish tacos, clam chowder, (massive) burgers, and more. Been here for Taco Tuesday? If not, check it out and get your tacos with a side of Oceanside Harbor views from Lighthouse’s second story. This quick-casual, grab-a-fast-bite place is right by Buccaneer Beach and perfect for satisfying burger, fries, and lemonade cravings. Pick something up to go and walk a few steps to the ocean for the most authentic waterfront dining experience. The 13,000-sq.-ft. Decoy Dockside Dining restaurant is part of the Lakehouse Hotel & Resort property sitting alongside Lake San Marcos. A rustic but modern design, two outdoor patios, and unique menu make Decoy an excellent waterfront dining option away from the coast. Where are your favorite seaside dinner spots?